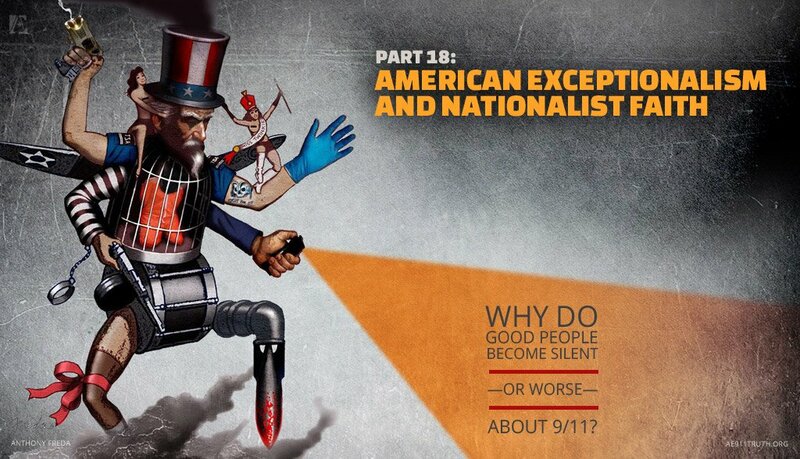 Why Do Good People Become Silent—or Worse—About 9/11? Part 17: The False Self and Excessive Identification with the U.S.A.
"If a person’s false self includes identification with America as a country of unequivocal goodness, then to be exposed to information suggesting that America is in fact an imperialistic aggressor . . . is to have one’s self-image seriously challenged." In addressing the question in the title of this essay, the April 2015 segment, Dissociation, explained that some individuals suffered severe developmental trauma in childhood that caused them to reflexively shut down their awareness of these traumatic events. This biological process is known as dissociation. Such repressed traumas can be activated by information conveyed by 9/11 skeptics — information that implies that forces within our government may have been involved in mass murder of its own citizens — causing these individuals to dissociate once again.